getcalc.com's Voltage Divider Calculator is an online electrical engineering tool to calculate the specified voltage at the output terminals by adjusting values of input voltage, resistors R1 & R2 of an electrical circuit. Voltage Divider is basic element of electrical engineering, an arrangement of two or more resistors connected at any intermediate points of a circuit to produce a specific fraction of input or source voltage at the output terminals. 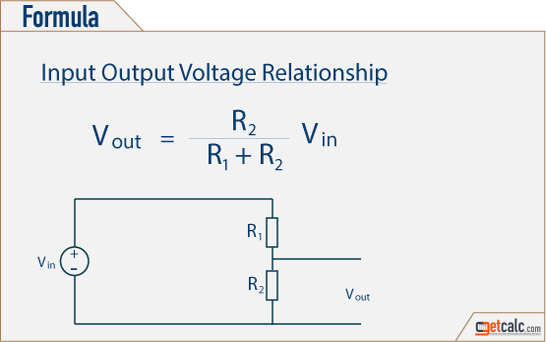 The output voltage is directly proportional to the product of input voltage and the ratio between resistor R2 and sum of resistors R1 & R2. Voltage divider may tapped into any high voltage line to get the desired fraction of voltage and use it in the voltage specific circuits.